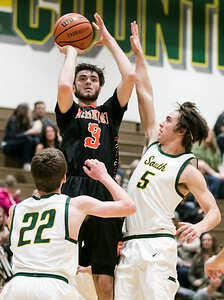 Sarah Nader - snader@shawmedia.com McHenry's Brian March (left) has his shot blocked by Crystal Lake South's Matthew Reall during the third quarter of Saturday's game in Crystal Lake Dec. 2, 2017. 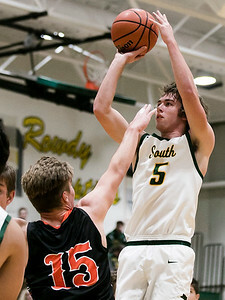 Crystal Lake South won, 43-40. 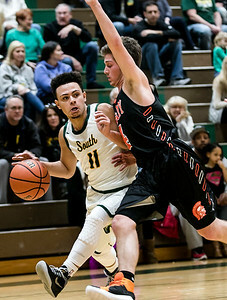 Sarah Nader - snader@shawmedia.com Crystal Lake South's Jonathan Holloway (left) is guarded by McHenry's Giovanni Calabrese while he dribbles towards the basket during the second quarter of Saturday's game in Crystal Lake Dec. 2, 2017. Crystal Lake South won, 43-40. Sarah Nader - snader@shawmedia.com McHenry's Maki Mohr (left) and Crystal Lake South's Matthew Reall both reach for the rebound during the second quarter of Saturday's game in Crystal Lake Dec. 2, 2017. Crystal Lake South won, 43-40. Sarah Nader - snader@shawmedia.com Crystal Lake South's Kyle Leva shoots a basket during the second quarter of Saturday's game against Crystal Lake South Dec. 2, 2017. Crystal Lake South won, 43-40. Sarah Nader - snader@shawmedia.com McHenry's Gavin Charles Markgraff (center) shoots a basket during the third quarter of Saturday's game against Crystal Lake South Dec. 2, 2017. Crystal Lake South won, 43-40. 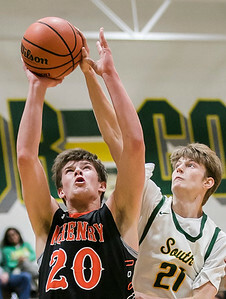 McHenry's Gavin Charles Markgraff (center) shoots a basket during the third quarter of Saturday's game against Crystal Lake South Dec. 2, 2017. 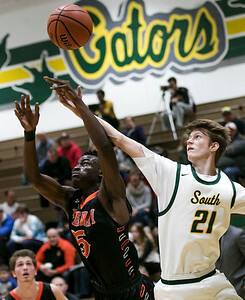 Crystal Lake South won, 43-40.